Topics: Services, Monthly Auction, and Auction List. It has 5 nameservers, including dns03.gpn.register.com, dns04.gpn.register.com, and dns01.gpn.register.com. It is hosted by Icon Developments (Utah, Lindon,) using Resin/3 web server. 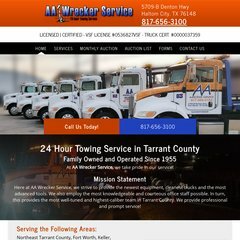 Aawreckerservice.com's server IP number is 192.41.9.23.